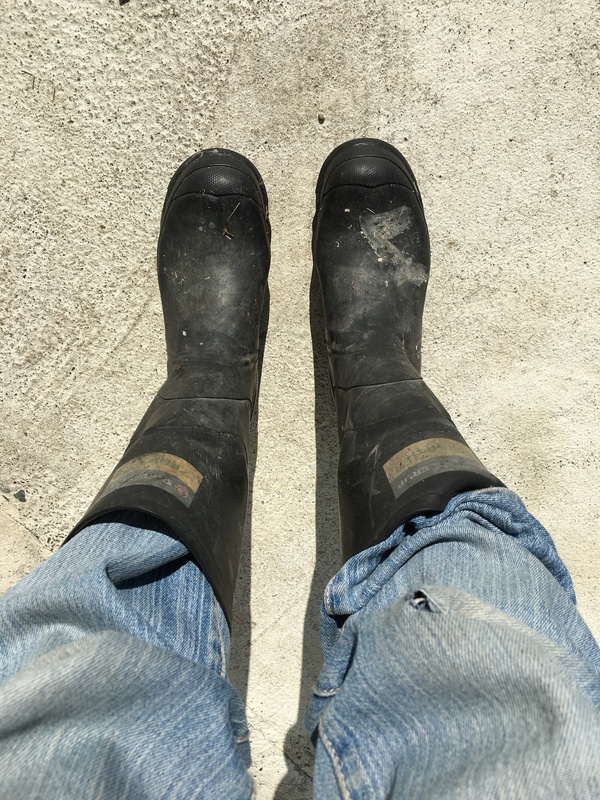 My daughter and I wear the same size gumboot, but there’s never any problem telling them apart. That’s because gumboots tell the story of their wearer’s activities. A smear of paint—Sicily White—tells of a hot summer day scraping and painting the house. A job that had to be called off, because the paint was drying so fast, I couldn’t spread it. Another glob—brick red—tells of another summer day fixing and painting the roof, balancing paint bucket and feet on the peak, and looking out over the hedges to the lake and sea beyond. Lavender speckles recount an afternoon drenching goats, when a syringe of purple medicine burst open and splattered everywhere. Bits of hay relate frosty mornings feeding the animals in the dark, by moonlight and starlight. Smears of mud describe weeding and planting in the vegetable garden. Clumps of goat poo tell of afternoons in the paddock, hand-feeding grain to eager goats who push and shove to get more than the others. The tales are fleeting—even the most enduring splatters fade in time, replaced by the next instalment of my life in gumboots. Extremely fun to read your blog! Wouldn’t have guessed this is where you’d be 30 years ago….very, very cool!